These shoes started their journey on a trip to New York. I fell in love with them instantly because of their pink bandana print inside... I knew that no-one else would see that bit but I was happy just knowing that it was there! I felt guilty about buying them as I couldn't afford them and put them on my credit card, I justified the spend as I'd probably never have this opportunity again... how often does a girl get to go to New York in a lifetime?! The first time I wore them was crunching through the snow on the way to the coach back to the airport. They've brought me through times happy and sad, they're the ultimate comfort shoes. 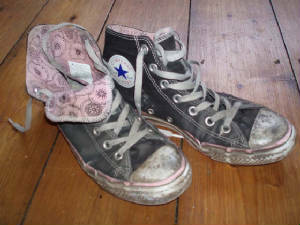 You can see how well worn they've been... they're covered in marks that remind me of the past (you're not a proper art student without a drip of paint on your shoe!) Despite the fact they've had better days I just can't bear the thought of parting with them, every now and then when the occasion for a slobby clothes day arises they come back out of the cupboard and remind me of all those happy times.